The first step in any design project must be an assessment of what you have to work with, what you would like to achieve, and how you intend to get there. The best designs are the result of a response to real conditions and constraints. Start by taking a good look at the site and by thinking realistically about your needs. A complete landscape should allow you to live outdoors in comfort and beauty. Some reasons to improve your landscape may be to: create more usable areas for entertaining, hobbies and recreation; improve the aesthetic appearance of your home; increase privacy, reduce noise, screen unattractive views; improve safety and security; provide food for you or your family. For many people, the idea of designing their own landscape is an exciting, but often perplexing step. A well designed landscape can enrich the aesthetic and functional environment around your home while increasing the value of your property. But successfully designing the outdoor living area around your home can be a complex and intimidating task. Whether you do all of the design and construction yourself or bring in professional help at some stage in the process, it is my firm belief that following the design process laid out in this article will result in a far better design- one that will bring you pleasure for years to come. This outline will touch on the essential points to consider when approaching a design for clients-a broad look at the process of designing a landscape. Although some of the steps may not apply to your exact situation, do take time to consider them all. There may be opportunities uncovered in the process that make the difference between just another garden and a landscape that suits you and your property to a ‘T’. What does the property have to offer and what needs to be changed? Each property may have a combination of opportunities or constraints on the same site. Some naturally lend themselves to certain activities, while others may need modification through landscaping. Make a note of: hot and sunny/cool and shady areas; overly windy/pleasantly breezy spots; good views (mountains, skyline trees, ocean) and bad views (your neighbor’s RV); the sound of running creek/noisy traffic; rich soil or rocky clay. Where are the most appropriate areas for the activities you want to accommodate? Various parts of your landscape will lend themselves to certain activities. Where would you be the most comfortable or appropriate spot for entertaining a small group of friends, reading a book, playing with the kids, growing a garden, engaging in your hobby, soaking up some rays or quietly meditating? The best landscapes feel as if they belong with the house and the site—they sit gently on the land. Consider the architectural style of your house, the neighborhood context and any unique qualities of the property. Also consider how people might move about the landscape, including how your guests arrive at the door or how your walkway and path systems work. There is also a need for practicality—call it a “reality dose”. You have to be able to live not only in your landscape, but also with it. How will the new landscape suit the needs of you or your family? Give some thought to your commitment to maintenance as well as the necessary skills to produce a landscape that you will be proud of and enjoy. Must it all be done at once or can it be done on phases? How much do you intend to spend and is that amount realistic? Know the codes and restrictions which might limit your level of ambition. The analysis is not intended to lead to paralysis—it should help you to understand all of the possibilities that your landscape can help you address. Then you can set some priorities and get on with the design. Goal – create a “slice of nature” in my backyard. Concept – develop a native plant botanic walk that attracts wildlife. Objectives – grade a switch back path up the rear slope, screen out all signs of civilization, establish plants with seeds, fruit, etc., that will attract birds year-round. What sort of garden will best fit your lifestyle and the look of your property? Style comes from response to surroundings, the geometry of the layout, types of plants, color schemes, selection of materials, and selection of furnishings and garden art. 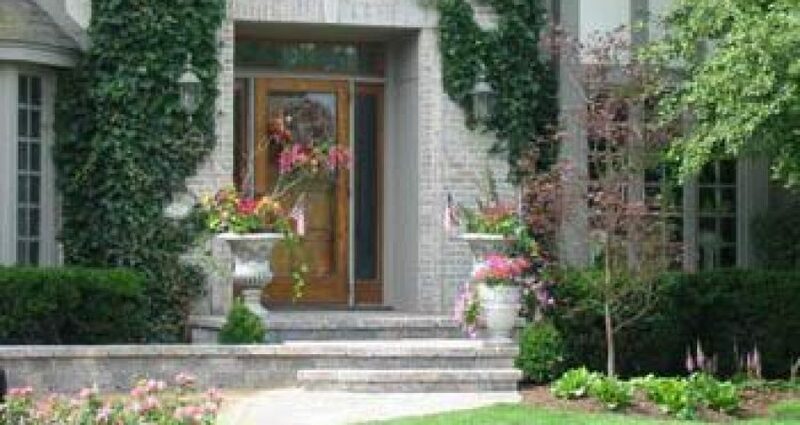 If your home has a distinctive architectural style, the landscape style should embellish it. If your house is more neutral, you may have a greater range of style which could fit. A short list of styles: Mediterranean, formal, urban, modern, personal, southwestern, subtropical, rustic, cottage, Japanese, courtyard. Regardless of style, an entire garden or a portion can be based around a theme: sound (water, music, bells), fragrance, movement, water, nature, forest, meditative, color, roses, herbs, edible, vistas. Unity – recognizable links between materials, color, plants, patterns, etc. Balance – use of color, mass, form, texture to create equal visual weight. Proportion – the scale of various elements as they relate to each other and to the site and its architecture. Be sure to consider the mature size of plants. Variety/Contrast – there is a fine line between variety and being too busy. If every inch of the landscape is “special” the effect will be too disturbing. Bubble Diagrams and Outdoor Rooms – Think of the proposed use areas as rooms of a house. Do some quick sketches in order to explore the various configurations of patios, paths, screening elements, etc. It is far quicker and cheaper to move your patio, hot tub, and vegetable garden on a sketch than after the concrete has set up. Challenge yourself to develop as many variations as you can. One of the toughest phases in a design is to start giving form to your ideas—determining the ideal size of the features you intend to create. Outdoor dining for 2 couples vs. the entire “clan” will require different solutions. Measure an equivalent indoor room, try to imagine the furnishings that will occupy the space and transpose this “room” outdoors. Once you can think of areas of your landscape as outdoor rooms you may wish to consider what the “walls, floors and ceiling” will be made of: planted or built; opaque or dense; bright or receding. Even a small yard can often benefit by being subdivided or by creating controlled views. Each space can be “furnished” with a different, but harmonious theme. Be certain that any new construction is compatible with the house and existing features that will remain in your landscape. Try to assemble a “family of materials” that work well with each other and the site and be sure that you can successfully build what you see in your mind’s eye. If not, select a qualified designer or contractor to assist you in this phase. A tour of some of the local building material yards or any area with new homes will help you to see what is available in the trades. Also, be sure to go through all of those back issues of garden magazines you’ve been saving, or hit the library. The placement of plants should first be dictated by the functional requirements of the landscape: shade, screening, erosion control, etc. Your planting design will be most successful if you first sketch out general massings of these plant categories in this order: trees, large scale shrubs, medium and small shrubs, perennial plants, and finally, annual color. Now for the fun part – plant selection. Choose plants that look good together even when they are not flowering. Paying attention to a plant’s overall natural shape, foliage color, texture, and density will help to create a garden with year-round structure. Select colors that harmonize with the house and surroundings. Colors are generally lumped into warm (yellow, orange, red) and cool (green, blue, lavender, purple). White and silvery act as dividers and as neutral brighteners. Flowers of similar intensities and brightness usually go best together. Save strong contrasts (purple with yellow, for instance) for special locations where extra “punch” is needed. Remember that plants grow ! Be patient and do your homework. Work with your landscape contractor to select plants that can grow to their mature sizes in the space allowed without having to trim, shear, or have them jumble together. The plants will look better and it saves you work. Be sensitive to the various microclimates on the property. Within any site there are significant variations in growing conditions—sunny, west-facing walls or cool morning sun. Find the right plants for the right spot. Selecting plants for your landscape that will look good together, be compatible, and grow to the right size can be confusing. Start by deciding where the main trees should go. Then find three plants that work well together and pretend that you will only be allowed to use these three plants—one type of tall shrub, one medium and a colorful small shrub, perennial or groundcover. Decide which parts of the yard need tall, medium, and low plants and draw them on the plan in large masses. Colored pencils can be a help. You can then go back and find two low plants that go together, and chances are they’ll still work with everything else. Continue subdividing the main groupings, but be conservative. You will be more successful with a large quantity of a few species, than with a scattering of a great variety of plants.